It was almost as if it wasn't really happening. I've been pushing this day to the back of my mind for over a year now - not only because my youngest is entering Kindergarten, but because it's been a loooonnnng ride getting there. To make a long story short, the past year has been riddled with anxiety for me just thinking about Zoë going to the big school. I know I'm in the same boat as most parents with kids going to Kindergarten, but this was a first for me. With Jadon, I was like "bye, see ya" (and that's pretty much how the drop-off went with him this morning LOL). With Zoë, it was "will she have support? ", "how will she be able to keep up with her classmates?" and "what will her mode of transportation be when the entire class ventures to the local park?". I've spent close to a year gathering Zoë's doctors' and therapists' reports, and submitting them to her school. Out of pure luck, our Vice Principal is also our learning assistance coordinator and very well versed with cases of muscular dystrophy. When she told me this, it was as if a weight was lifted off my shoulders and I could really concentrate on the other little things of getting a child prepared for their first big day. Of course, the preparation would still be different from my experience when Jadon was entering Kindergarten, but at least I had that piece of mind that Zoë was going to have the support she requires and the understanding that I so desperately hoped for. I could go on and on about the rollercoaster of emotions that's plagued me in the past year, but that can wait until a later post. Let's get right into the part where Zoë is Zoë and she's been waiting over two years to join her big bro and his friends at the big school! Honestly, Sport Chek has always been my go-to, one-stop shop for all things sports, fitness, back-to-school, Father's Day... you name it! As a working mom, it's extremely convenient for me to stop at one store (especially when I have that long ride home ahead of me!) and be able to grab whatever the kids need for back-to-school shopping gear, as well as pick up anything that hubby and I may need. A huge thanks to my Sport Chek fam for spoiling me AND the kids with back-to-school gear! Jadon can't get enough of his never-ending Under Amour backpack - that thing is like a bottomless pit and perfect for our newly-minted grade three-er! Disclosure: All opinions in this review remain my own and do not reflect the opinions or views of Sport Chek and/or their affiliates. 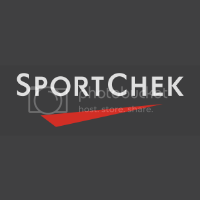 We received a form of compensation from Sport Chek in order to complete this review.